How a 1 Page Site Earned me $100k in 1 Year. I’ve never had a site earn me more than the one in this case study, where literally with just 1 page, I was able to make $100k in a single year. I will explain exactly what I did to make this single page site, how I marketed it and how I made the money through it. I will also include a check below (for proof of course!) 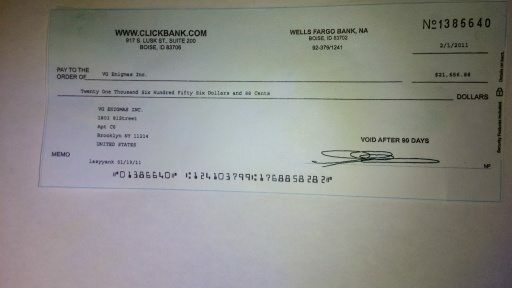 I got from the promotion (Clickbank) which was over $20k earned from just 2 weeks. Now as amazing as this case study and experience was for me, let me just say that in online marketing, most of the projects you engage in will not work. That’s a fact everyone whose in this business will have to learn, but through the experience, you will get better and in truth all you need is 1 successful site to experience the amazing benefits of internet marketing. That happened to me with this case study. So in regards to THIS case study, it wasn’t just $100k in a single year. It was nearly $200,000 over a 2 year period ($187,000+ to be exact) through 1 website, a popular T.V show, using training from Wealthy Affiliate and using Bing Ads. It was the December of 2011. I was regularly looking up ideas for new ways to promote whatever came out. To do this was I was constantly looking at Google Trends, a popular free website on Google which helps you monitor popularity subjects that arise on a daily basis. 17daydietdrmoreno.com (Feel free to check it out), put it up on Bing advertising and promoted a program called Fat Loss 4 Idiots through it. My whole point on that page was to talk about the 17 day diet but explain how Fat Loss 4 Idiots was better. I would later also promote the same method through Google ads, a strategy which would not work today (2019). In truth both plans used the same method of dieting, but Fat Loss 4 Idiots was faster and that is what I explained. I never said ANYTHING bad about the 17 day diet. I was very honest and let the customer decide which was better for them. My first day yielded $400+ in profit. I would later have days where I would made $1,000′s with the biggest day being over $7,000. This niche would end up making me nearly $200,000 with about $60,000 being spent on advertising on Bing. Either way, it was an incredible feeling to wake up every morning and see $100′s in sales. Now later on one of the biggest lessons I took from earning so much from this website was that to make the big money, you need to target the huge laser niche, which this particular topic was perfect for. And by the way I didn’t forget about putting up a picture of the first check I received from this project ($21,656.88 and it’s coming up). My next paycheck was for over $18,000 and this was all for the month of January for which the total was $40,000+. 1. Used Google trends to discover the 17 day diet. 2. Made a website talking about the 17 day diet but promoting an easier alternative: Fat Loss 4 Idiots. 3. Promoted the website via Bing ads. What you need to know is that in internet marketing, timing is crucial. It’s very rare to encounter a popular niche such as the one I did and make money through it. I’ve discovered many niches like the 17 day diet and tried making money of it only to fail. This is a fact of life when it comes to internet marketing: Not every project you do will make you money. But even though that happened, all it took was 1, just 1 project to make me earnings most people do not make. And I also would like to mention that I worked less than 100 hours for the ENTIRE year of 2011. This was all because the money kept pouring in, literally. 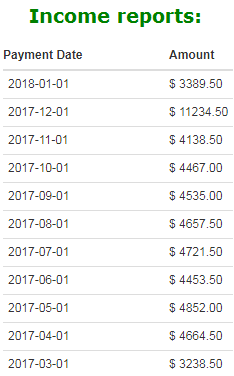 In hindsight, looking back on that moment, I should have used that money to re-invest and work longer, and harder, but what’s done is done. Even though from time to time niches like this pop out from which you can make an incredible amount of money from, the truth is you can make a GOOD and even amazing amount of money weekly, monthly and yearly from niches which are popular all year round and have stable income coming in. 2. Find a popular trend which you can monetize off. 3. The ability to have/create a website. If you’re going to capitalize on hot niches appearing on Google trends, you need to have a website ready. But since niches can be different, it makes no sense to have 1 website for all of them. It also doesn’t make sense to have multiple sites because this will end up costing you a lot of money in the long run. My suggestion is to have a free website ready to create and fill in as well as prepared to advertise on Bing. For that I recommend this free website building tool. 4. PPC training (if you don’t already have it). I would highly suggest getting PPC training here, otherwise you’ll end up spending a lot of money and not making a good enough profit. If you are seeking to recreate this kind of success in your life, don’t just depend on PPC alone or finding that 1 magic niche. Those are hard to come by. Instead, if you’re looking for stable ways to make money online & legitimately, make sure you’re utilizing not just this method of marketing, but also all the other forms available. Finding hot niches and making a website that gets a ton of traffic! But mistakes were made too. See the case study. If there are any questions/comments you have about this case study, feel free to leave a comment below and I’d be more than happy to answer 🙂 Always remember that in internet marketing, it’s never a 1 size fits all approach. If there’s anything you should take from these lessons, it’s how to think outside the box and apply it on YOUR own way. Now I would like to point out that this check is a scanned copy of the original which I deposited shortly after I got it. I mean…how could I not save a copy of this!? When the diet program started to lose steam, I ended up reaching a point where I had barely any profits, broke even and eventually started to lose money. This made it a none profitable venture for me to continue and I was eventually forced to shut down the site. However, what it brought in was proven above and it can be done with ANY hot niche topic. Further, I’ve had similar experiences such as the one in this case study and in every circumstance, I promoted products like Fat Loss 4 Idiots, all of which were a part of the same affiliate network known as Clickbank. To date, I still remind myself of the potential of how much one can make online when all the ingredients are there like it was in this case. But I also learned the importance of not waiting for this and to focus on long term profits so I wouldn’t need to keep chasing this type of opportunity because of it’s rarity and it’s why after this project eventually fell apart, I decided to follow this program’s advice on making long term profits online. Hi Vitaliy are you doing? I really loved the article but I have a few questions? 1. What would you recommend for someone who already has a website but very low traffic? 2. What if I found a great sub-niche? Can I go and promote it with Facebook ads or I have to go for SEO? Can I have a quick private session with you via Skype for about 10min? Thanks a lot and congrats for the great article, cheers. 1. If you have a site with low traffic, there’s numerous reasons why this is happening. I would first ask what your website is about and what you currently do on it and this would help identify where the lack of traffic issue is coming from. 2. If you find a good sub niche and have marketing experience and a budget, the way I’d go about it is through Bing Ads, not Facebook and if that sub niche’s topic is connected to an existing niche site you have in it’s topic, then you can go ahead and write an article for that to get some SEO rankings. You have a niche site on low carb diets and find a sub niche topic, which is a popular new low carb diet going around. You can write an article on your site for it, then run Bing ads and get traffic to that page whilst also helping it grow through SEO. Hope this makes sense. Really inspirational post, thank you. I wonder if it’s possible doing that today, because affiliate marketing has grown a lot lately. Here’s what I want to ask you. I’ve been somehow following this strategy for a while – writing a review of a product and trying to convince people that another one is better, so leading them to it. In this I’d get a commission for the second product. But can you use product A’s name to write a negative review and then send people to product B that you promote? Assuming I say the truth about product A. I ask because I heard cases when product A’s company sued the reviewer for trademark infringement. Obviously, they only did it because it was a negative review. I found lots of reviews about product A on Google, and many sites are sending people to another product. But those reviews are simply stating general things, it’s not like they tried the product. That seems pretty useless to me, as none would really go to product B’s review in this way. So how do you recommend doing this? Would companies really sue someone for a negative review? Thanks. Hi Michael, great question and I actually have several personal experiences with this. I’ve had a few situations where a cease and desist was handed to me (via email) and/or a post was taken down due to an overly negative review I once did (which was actually factual). These types of situations happen, but rarely. Obviously, no product owner or company wants to see their name trashed in reviews and will obviously do whatever they can to prevent that. Some of them do it legally in cases where the person who writes a negative review is being dishonest (and they are right in this case) and then there are cases where a negative but honest review is also targeted by a product owner because they just can’t stand the bad PR. 1) When I write a negative review, I have to PROVE it’s negative and the best way to do that is to buy the product and explain to people why I’m giving it a so and so review. This honestly makes whatever reviews you write better than the general ones you talked about because you are actually providing REAL evidence for your point of view and you’re completely entitled to that opinion. 2) At the same time though, be a little more neutral about negative reviews. Don’t call a product a scam (unless every piece of evidence suggests it is), call it a product you’re not really happy with and then recommend the one you are happy with. Again it all comes down to being honest. You have the right to say what you wish about a product, so long as it’s honest. When you call a program or product a scam or you start bashing the product owner without evidence, that can absolutely be considered defamation (rightfully so) and to avoid it, just be nice about the product review, say that you weren’t really happy with it and then give you other recommendation. In this case study for example, I was recommending a different diet program, but I wasn’t BASHING the popular program in question. I just gave the REAL facts about it, so there wasn’t really anything the product owner could latch onto and complain to me about. Excellent article and great information, thanks for sharing how you work and your results, this is a great motivation to help me to keep on building my own site. Hey, you suggest having a free website ready to create and fill in. Do you mean setting up a free website domain right now so if I find a niche later, it has had some time to mature and then I can quickly fill it in… or? Please elaborate for me! If I understand correctly Samuel, what you’re asking me is if it’s worth buying up domain names or making free sites and waiting for the right moment to use them if a big niche topic comes up and if time passes and the site is live, then it’ll gather time to mature in search engines and thus if you start it up when it’s mature, it’ll rank better, correct? If so, then the answer is no. Do not do this and that’s because waiting on hot niches to pop up is like playing a guessing game and/or like trying to win the lottery. Also when a site is empty, it doesn’t matter how old it is, what matters is the content on it and how old that is. I talk about the age of domains here and that it ONLY holds value when there is content with it. The only reason THIS case study worked for me was because I funneled PPC traffic to it, not SEO traffic, this type of 1 page site would NEVER rank high because it was only 1 page and that’s not enough for SEO ranking. Great to see someone has had success! Still learning the trade here. There were a few useful tips in your article which reminded me of things that I had forgotten. Easy to get so much info that the brain suffers from information overload at times. I think google trends is one of the most important must do’s? The early bird catches the worm! Google trends is certainly an important tool Pete, but it should not be looked at as the only available means to make money through. I made that mistake and as the 17 day diet fell in popularity, I relied solely on Google trends to find me a new diet to promote, but nothing appeared and thus I lost a lot of time and profits through this. Amazon is one place I also recommend always looking at for products to promote, I tend to find way more ideas than on Google trends. I like the way you have described what to do and then used hyperlinks to guide the visitor to the site they can use to accomplish what you are telling them to do. You are not holding anything back and if people follow the instructions on the sites you send them to they can be successful. Your recommendations are honest and they work. That is refreshing on the internet. Awesome article and great insight for anyone looking to really make money online. It can be frustrating at times starting off as a new blogger. Your article does a great job explaining that the failures are not failiures, but instead lessons for setting yourself up for future success. Such a great and integrity-filled article about how a simple idea and simple website became a success. I love how you kept it positive in your reviews on the 17 Day Diet. Very inspirational and insightful. Great read. I had gone through Google Trends during the WA training but I had completely forgotten about it. It is certainly a tool to not be underestimated. Thanks for bringing it to my mind again. To succeed in online marketing you have to be smart, learn from other people’s experience and your own experience. I have never made such 20K paychecks. For me, the maximum was about 1.5K with AdSense about four years ago. Google has changed its algorithms, and previous gray hat promotion methods nowadays do not work anymore. I resumed the internet marketing path again. Have some bitter experience and luckily found the Wealthy Affiliate community. My paycheck is still is far from figures on your picture, but at least I am sure that my online property is white and beloved by Google and needed for people. Then keep building the site so it reaches the same figures and more! I was a bit skeptical when I first started reading this, but I think you’ve fairly presented the method for your success and I can see how this works, being in marketing myself. One thing I wanted to ask. Did you invest a lot in PPC at the beginning to get traction, or was it a case of the money started to come in, so you had the funds to invest in advertising to ride the wave of success? It maybe sounds like chicken and egg, as I can see the advertising must have had a direct result, but the amount sounds like quite a lot to invest up front! I look forward to hearing your response. The thing is I didn’t need to invest, when I tested this PPC campaign out and saw how crazy the conversion rates were, I just had to run the ad, make the sale and the costs were covered right there, so I didn’t need to set anything aside. When the campaign was making thousands a day, investing a few hundred FROM the profits was an easy decision. I’m just about ready to learn PPC but I’m worried I will be spending a lot of money on a gamble. Do you recommend PPC on bing and not Google? Or have I misunderstood your message? Do you still use your free site? Do you keep different one page promotions in different niches on your free site? Hi Janelle, i typically prefer Bing over Google for experimental PPC and it’s a lot easier to get started there too. Since the niche that dealt with this case study is no longer popular, I actually deleted it and no longer use it, despite how much it once made me. And I have tried to follow the same 1 page promotions after this event, but it’s far better to have a niche site. This is really inspiring and just when I was starting to wonder. Any updates on this strategy for 2016-2017? Have you repeated any where near this kind of success? Hi Alison, I have come close several times, but you are absolutely spot on regarding the flash analogy. This kind of strategy will work today and as long as Bing allows for pages to show up quickly if you use their ads, but the more difficult thing is finding that niche first and if you do, monetizing it. I pointed out all of this before when I talked about micro niches and how if you implement them correctly, you can basically “insure” a point where you even if you don’t find that lucky product that makes so much money, eventually you will and residual income from promoting these types of popular products will add up if you do SEO. Your level of success is outstanding. Did most of your sales come from Bing or Google ads? How many keywords did you bid on PPC to advertise your website? It was about even. Most of it would have come from Google ads if I started it earlier, but it evened out in the end. As for keywords, I believe it was less than 20. Most of the sales came from 2 or 3. I can’t imagine the excitement that would come from building a simple site that took off on such a popular niche. Weight loss has to be one the most popular searches on the internet. Yeah it was definitely a VERY pleasant surprise. But it is also true that I tried to follow the same formula for a number of other diets and it didn’t work out nearly as well. As I like to say about PPC, it really is a gamble at the end of the day. Do you think this method would still work in 2014? My PPC experience is limited, but something tells me the right campaign would work! With a hot market, these opportunities are very possible. This scenario wasn’t the first time I had success through this method.